England manager Mark Sampson is expecting anything but an easy ride when his side face “real awkward” Colombia on Wednesday looking to seal a spot in the last 16 of the Women’s World Cup. The Lionesses currently lie second in Group F after one win and one defeat and are a point behind surprise leaders Colombia heading into the clash at the Olympic Stadium in Montreal. Although the Colombians are the lowest-ranked side in the group Sampson is not taking anything for granted and knows his team will need to be on their game against the South Americans who defied the odds to beat one of the tournament favourites, France, on Saturday. Sampson also admits that because his players are more used to playing European sides, Colombia will be something of an unknown quantity. “I’d describe them as a real awkward opponent,” Sampson said. “They’re a team that will make your life as difficult as possible. “They’ll have players in positions where you don’t expect to see them. “We’re a European team: we like to play against the Germans, the French, the Dutch, the Danes and all the Scandinavian countries, where if you lose the ball you know where they’re going to be, and when you’re defending you’ve got an idea where their players are going to be. “Colombia will cause you problems: they’ll get into awkward positions offensively and defensively. Colombia’s shock win over a France side ranked third in world rocketed them to the top of the group and they know that a draw against England will guarantee them a berth in the knock-out stages. 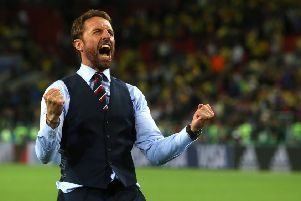 England, meanwhile, need to win to be assured of a top-two finish in Group F with France favourites to beat last-placed Mexico in the other game, but Sampson’s team could also progress through as one of the four best third-placed sides. England striker Toni Duggan, who made her first World Cup start on Saturday as the Lionesses recovered from a 1-0 defeat to France in their opening fixture to defeat Mexico 2-1 in Moncton, is in confident mood ahead of the Group F decider. “We’re full of confidence and the buzz around the place is good,” the 23-year-old told the FA. “We’ve got the ability and we’ve got the belief. Now it’s about merging the two together and hopefully we can come out on top. “Colombia obviously came into the tournament full of confidence and are unbeaten so far. Colombia created the first big shock of this year’s World Cup after beating France 2-0 at the weekend having drawn their opening match against Mexico. It was Colombia’s first-ever victory at a FIFA Women’s World Cup but goalkeeper Sandra Sepulveda is hoping it is not the last headline they make in Canada.